I found an old copy of Little Women on eBay a while ago (not the one I cheerfully folded into paper flowers!) and when it arrived I read it as soon as I'd torn it out of the jiffy bag, I almost know the story line for line having read it hundreds of times since childhood but somehow it has never lost it's hold on my heart. I turn the pages as eagerly now as I did on reading it for the first time and I feel tears welling in the same places, laughter building at familiar funny moments. There are few books that have moved me in the same way as the story of the March sisters, though admittedly I wailed a little at parts of Marley and Me and again when reading My Sister's Keeper, parts of Sister by Rosamund Lupton also kicked off the water works. Typing this there seems to be a theme emerging - if there is a sister in peril or an animal (now remembering that Black Beauty also had me in tears) in the book I'm likely to cry when something sad happens to her/him/it! For someone who doesn't cry easily in general I seem to do plenty of it with the right book under my nose! If you haven't already I heartily recommend reading Little Women . . . .
On a much more shallow 'it's pretty, the typography is amazing so I need it' note - I clocked an interesting looking spine among the shelves in Cancer Research and pulled out the book to take a better look. Classic case of judging a book by it's fabulous and intriguing cover, bought and bagged, I only took a glance at the blurb once I'd got it home. In my defence it looks eerie, kitsch and full of promise all at once - so I decided even if the book itself didn't float my boat I'd love having it on my shelf/using it as a photo prop but the inside cover sounds good too - click to enlarge if you're interested! Which books have moved you? Those books certainly do have fabulous covers, the White Witch will look fabulous display at Halloween. Like Rachel, I love old books too. The cover of the White Witch does look rather wonderful although the storyline isn't floating my boat. I'm reading The Help by Kathryn Stockett set in the Deep South of the 1960s during the Civil Rights movement. V compelling and v moving. You know im a sucker for those old book covers! Bit disappointed that the White Witch isnt a good old spooky tale, the blurb is a bit of a downer - although it will look fabulous on the shelf! A book which really moved me to tears was 'Ten Thousand Sorrows' by Elizabeth Kim. Its very harrowing. lovely! I found an old copy of Little Women at an op-shop recently. It's covered in green linen and has handwritten in the front cover: "Dear Florence, Merry Christmas, Love Mum and Dad." ps. gorgeous blog you have here! I love the cover of 'The White Witch'. I'd have bought it for that alone. 'Flowers for Algernon' is probably the most moving book I've read, and has a heartbreaking ending. Jem what a gorgeous copy of Little Women. Another favourite that I love to re-read is The Secret Garden. Modern books that have really touched me include The Forgotten garden by Kate Morton and The Outlander series by Diana Gabaldon. The Outlander series is epic and every woman falls in love with the main character! Kate Morton's books have a haunting quality that stays with you long after you have finished reading. I didn't see this post 'til after I'd posted mine about crying, wasn't stealing the idea-honestly! When I was young my mum 'made' me read the Helen Forrester series about her childhood growing up during the depression in Liverpool. I would read in bed at night and often cried thinking about how difficult her life must have been. Elizabeth Goudge is one of my favorite authors but I haven't read this book, nor have I seen it before. It sounds different than most of her books but perhaps most along the lines of *The Little White Horse*, a children's book. 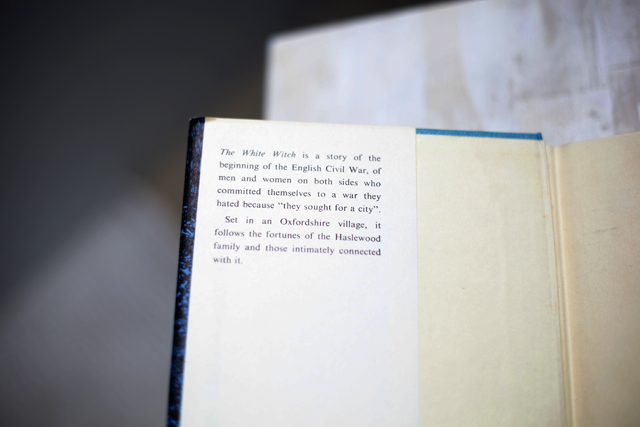 If you decide to read *The White Witch* I hope you'll tell us about it. well, as we've had numerous conversations about books, me recounting those that have made me cry is probably redundant, but I'm going to anyway! I agree with Little Women, Secret Garden, anything by Kate Morton, Sister by Rosamund Lupton too which I didnt think I was going to like but my mum made me read it and I did indeed cry! I usually cry at Jane Eyre when Rochester finds out he's...well, at the end when she returns, I'll leave it at that lest people havent but intend to read it. As you sob about sisters or animals, I mainly sob about orphans...Ballet Shoes really gets me weeping too. But, and this will come as no surprise, but from the end of book 6 to all the way through book 7 I cry at Harry Potter. Yes, its not big nor its clever, but however it still makes me cry. Just throw in a few house elves and owls croaking it, and I'm rushing through the book of tissues!